Compact and pyramidal with dark green leaves. 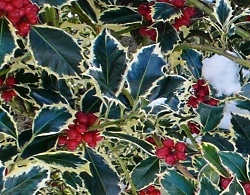 Red berries in winter when pollinated by a male holly such as 'Castle Wall'. Makes a nice evergreen hedge. Ideal as a specimen for a smaller landscape. 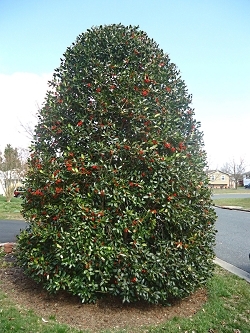 This evergreen holly tree slowly forms a large dense, conical shape. Beautiful year-round with red berries in winter. No need for a pollinator for this variety to berry. However, a male pollinator in the area will produce more berries. Very cold hardy and drought tolerant. 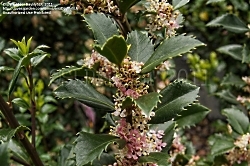 The Dragon Lady holly has beautiful glossy dark green foliage. 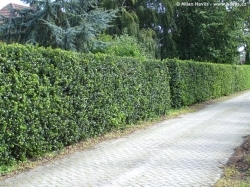 Its narrow width makes it an excellent vertical accent or can be used as a hedge or screen. This female holly will need a nearby male pollinator, such as 'Blue Prince' to set berries. 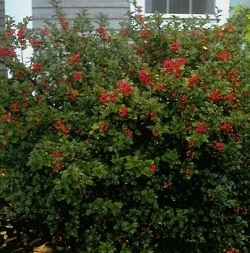 The red berries attract birds and other wildlife. 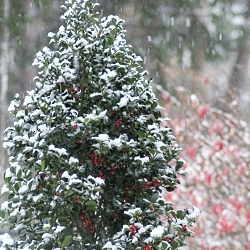 A vigorous grower, this holly's huge proportions place it in the tree category. 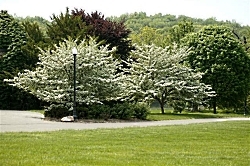 Plant several for a durable evergreen windbreak or as a privacy hedge. 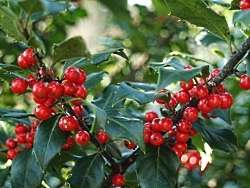 Produces berries if a male Chinese Holly is nearby. 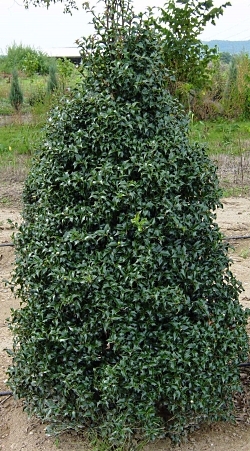 A hybrid holly with a tall, elegant, pyramidal form. Foliage is similar in shape to that of an oak leaf emerging bronze to burgundy in spring and maturing to emerald green. A male holly is needed to set fruit. This cold hardy variety is stunning as a tall hedge or specimen. Evergreen. 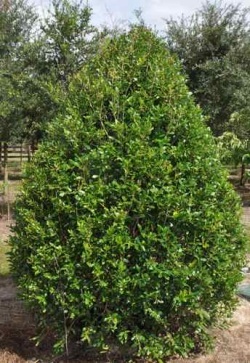 Popular selection with shiny, dark-green leaves edged with creamy-white margins. Pyramidal grower brightens winter gardens with showy red berries. Ideal for holiday decorations. Male English holly pollinator needed for berry set. Its pyramidal form is particularly beautiful as a specimen. Makes a great privacy screen. Excellent pollinator for nearby female hollies, such as Blue Princess or Dragon Lady. Brilliant red berries in winter. No pollinator needed.